Sure, my parents had to walk 5 miles to school, in the snow, barefoot, up hill both ways – but for those of us that grew up in the 80’s and 90’s, we had to wake up at 5 AM, glue ourselves to the TV and anxiously watch the scrolling alphabetical list of names on the morning news to determine if our school system was getting a snow day. For me, that meant stalking the G’s as they looped past. 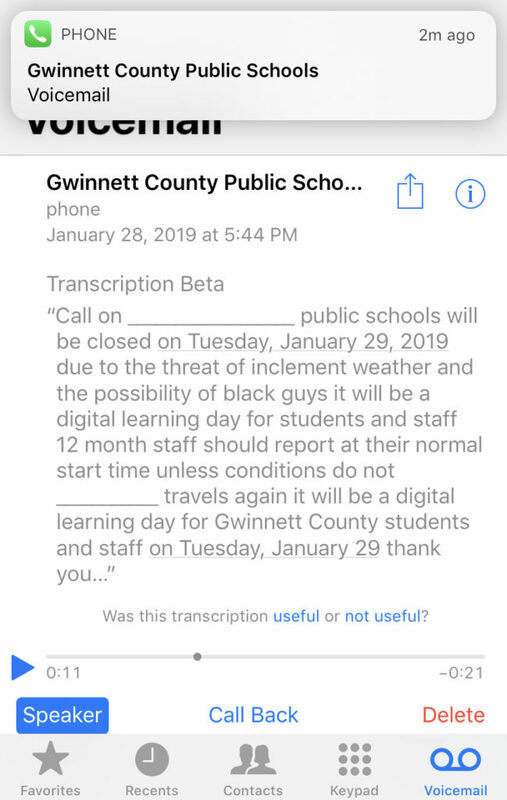 In those olden days, Gwinnett County Public Schools would wait until the last minute before making the call. Continually enduring that rotating list of “Gilmer” followed by “Habersham” was truly a perverse form of adolescent torture. However, there wasn’t a more exciting feeling than finally seeing G-W-I-N… make its debut as it joined the party and crept in from the bottom right. Technological advances are pretty amazing. When GCPS cancelled school this week, I received an automated text message, voicemail and email at 5 PM the evening BEFORE. Disregard the fact that it didn’t snow, didn’t ice, and the temperature didn’t fall below freezing in the 24 hours that followed – with digital “e-class” learning and no actual makeup days required, my kids will never know the deprivation [insert dramatic pained eye roll here] of my generation. But, technological hiccups happen. iPhones now transcribe voicemails – because who’s got time to actually listen to them anymore? As you can see, Apple has yet to perfect this electronic magic. Even with glitches, technology has dramatically changed the way we live on a day-to-day basis. Those changes, which inevitably advance farther over shorter periods of time, can sometimes leave me longing for the nostalgia of my youth. Our digitally ever-connected kids may never write a check. Or answer a corded phone. Or have to wait for a dial-up modem. And certainly won’t know the glory of Saturday morning cartoons. But, I have an overwhelming peace knowing that I’m doing my best to teach them about the one thing that will never change: Jesus. When the day comes that my grandkids are alerted telepathically that school is cancelled, I rest assured that they will also know the same loving, unwavering, unchanging God that made the universe, made me, made them, and made you.